Tomake salute:-D Congrats on completing..
but the shrimp looks good. I had seen the mushroom & chicken at cham's & will do it sometimes, but shrimp is a good idea & quicker too. LOL! Thin vs marriage and thin wins? I can identify. Everytime someone tells me my low-carb eating habits are my nemesis and health is what matters, not weight, I tell them I don't care for my health as long as I'm thin, and I was promptly labelled Queen of All Things Shallow! LOL....it was a cute read :) congrats on completing the challenge. Hmmm... I agree on a lots of things that u've mentioned. The initial diet mode can really take a toll on the mind and body, once we are on track...and see that's working well for us it really feels like a easy bridge heavenwards...lol at like the attainment of moksha, no inches no flinches... pizza no craving...hari om!lovely sandeepa. check out my latest post it might interest u dear! 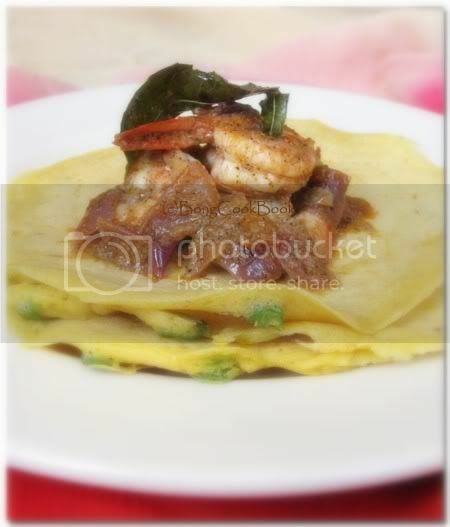 aiyo sorry forgot to mention....besan chilla zindabaad and love the peppery shrimps all spiced up. Congratulations on completing the challenge dear....hmm not eating out on weekends can be tough...for me it would be impossible :)....besan chilla looks delicious.. I love anything with shrimp but never had it anything other than rice. This combo looks inviting and interesting too. And yay good job on doing this challenge Sandeepa! Hats Off Sandeepa! Its like everything else the last few minutes tests your patience like any other. I can stand DH for 5 minutes max in the kitchen before I throw a fit. He takes advantage of that is another matter altogether. The cheela with shrimp looks totally awesome. you had to eat diet food (?) after breaking the fast to complete it? 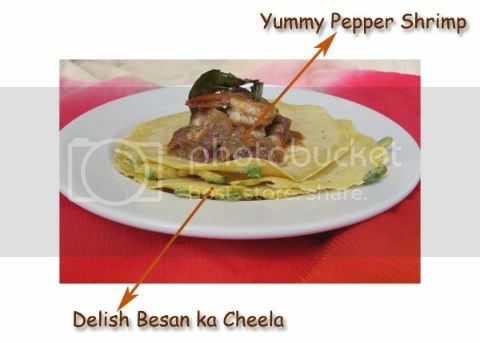 besan ka cheela and pepper chingri looks very apptezing :))..
Yaay, you did it!! :) Maybe somethng was in the air this weekend coz N and I were spiteful and had huge fights too! Glad that u completed with ease! Once we are used to cut back the sugar and grains, it will easy to stick in diet! I agree that we feel lighter which is better! Weekend, we use to go out and it is hard for us too! Thanks every one Don't know about the combo. I wanted some non-veg with the cheela and did not want to do eggs :) It went well. But good going, Sandeepa! I did it mostly to figure out if I can really work on self control. And enjoyed it too. Ya cooking these meals is a pain. So, this month, I'm planning my menu for all 7 days. will let you know how it goes! Planning is definitely the key to the whole diet. The mind constantly attaches a carb to all everything, and to train it out of it is tough. And it was actually surprising to me that not having carbs does not really make you weak. I missed my coffee & tea the most though :( Will surely try taking it up once a month. From a frequent lurker on your blog - congratulations for sticking with it! I've never tried fasting but I recently used Livestrong's food tracker tool (http://www.livestrong.com/thedailyplate/) to lose a few pounds. The pro is that you get a good sense of your daily calorie quota and it helps you exercise portion control while letting you eat everything. The con that made me quit tracking after 2 weeks is that most Indian dishes are not included so I had to manually create meals from individual ingredients (e.g. if I ate alu gobi for dinner I would create the dish with specific quantities of key ingredients i.e. potatoes, cauliflower, oil, etc.). Took up a good 45 minutes/day . They do have a pretty comprehensive food list though, including popular restaurant menu items and Indian store items. The exercise did give me a good sense of how much I should be eating for my weight & activity level. I did include some light to moderate exercise ~3 days/week. 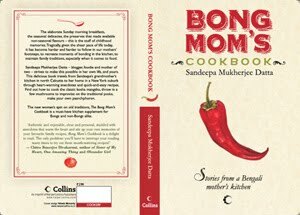 Least to say, I love reading your posts/recipes:) The cheela and shrimp look delicious! Why didn't I think of having non veg with cheela ... at least I'll be able to eat a cheela. Congrats on lasting the week - hope you can find something which is not so much of a chore and becomes a way of life rather than a "diet". The pepper shrimp looks amazing! The pepper shrimp sounds amazing . And to have it with chillas is a brilliant idea !